Minor's Chicken Base delivers the savory flavor of freshly roasted chicken and natural chicken juices. Since 1954 Minor's has been keeping passion and creativity thriving in your kitchen. To make recipe ready soup stock, add Minor's Chicken Base to boiling water and stir. Use 1 tbsp Minor's Chicken Base to 1 quart boiling water. Mix 1 pound Minor's Chicken Base with 1 gallon boiling water. 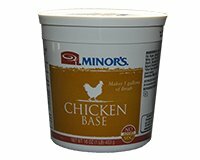 Nutritional Benefit: Minor's Chicken base is free of artificial flavors. Ingredients: Chicken Meat and Natural Chicken Juices, Salt, Chicken Fat, Sugar, Hydrolyzed (Corn and Wheat Gluten, Soy) Proteins, Dried Whey (Milk), Less Than 2% Maltodextrin, Natural Flavors, Corn Oil. Potato Starch, Disodium Inosinate/disodium Guanylate, Yeast Extract, Dextrose, Natural Extractives Of Turmeric and Annatto, Lactic Acid. No Msg Added Except For That Which Naturally Occurs In The Hydrolyzed Proteins and Yeast Extract. Allergy Information: Contains Milk, Soy and Wheat ingredients. Minor's® is a Registered Trademark of Nestle Foods.